Matty has picked up another 5th year transfer for the 2013-2014 season. Sterling Carter is a PG out of the state of Washington who started his college career at The University of Pacific, where he redshirted his only year on campus. 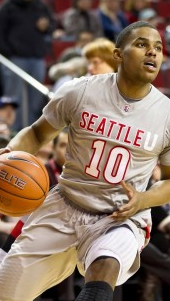 The next year, he transferred to Seattle University, sat out a year, and played his final three seasons in Seattle. His minutes dropped from over 800 during his Soph. season, to nearly 600 his Junior season, to 150 for his final year at SU after being released in January from the team. His points reflected his loss of minutes- starting at over 13pts/gm during his Soph year, and ending at 7 pts/game during last year, the abridged season. Honestly, I don't know anything about the guy...nor do I know anything about how Purdue started talking to him. I can't find any easy connections with the coaching staff or current team. BUT, GBI talked about a silent verbal commitment from a fifth year Senior months ago...and Sterling Carter is the guy. From what I've read, he's a streaky shooter who can torch teams when hot. He came off the bench twice in his last two seasons at Seattle to score 25+ points, and did most of his damage from behind the arc. He's also a pretty good on-ball defender. One game of note- he had three steals v. University of Washington in January of 2012. Whenever a guy has three stops during college, I never see it as anything but negative...But I don't know anything about this guy- personality, temperament, leadership, etc...So I won't speak about it much further. Methinks he might be able to come in and challenge the team right away in practice simply because he seems pretty skilled (from the limited stuff I've read)...But, my hope is that RonJon and Scott are occupying a ton of minutes by the end of the season as they'll obviously be here for the long haul. Carter takes Purdue's roster to nearly-full capacity. His nickname is "Sporty" and he is a guy who loves to shoot, according to a few more articles I've read. A Seattle U basketball blog called "SeattleUHoops" said there was no ill-will when he was released, and he didn't want to leave. The disagreement seems to come from Carter's quick, conscious-less trigger and Seattle's coach being a guy who loves to play up-tempo and get the ball close to the basket...We'll have more as we learn/hear it. After watching some video, here's what I see- he has a super-fast release, great handles in traffic and, at least a few seasons ago, had a ton of moxy, if you will. Kinda reminds me of an And1 mixtape guy...catch and release; if there's space, he's shoots from behind the arc. Seems a bit like AJohn's antithesis as he's not long, perhaps a bit undersized, but has one of the quickest releases I can remember seeing...and his shot seems to be pretty pure. He might be the only score-first mentality guy on the team, although TJohn obviously has some of that at times, but on the drive...we'll see how this all blends. Jun 4 IU Football (helmet) Mania: Catch it!